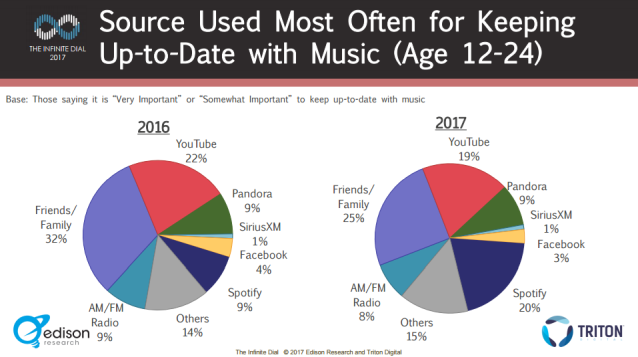 Keeping up-to-date with music is at least somewhat important to about half of Americans 12 and older, we learned from today’s Infinite Dial 2017 webinar, produced by Edison Research and Triton Digital. Only 14% of the total survey group, across all ages, said it was “very important.” It’s more important for younger music consumers (12-24 age group) than older ones. 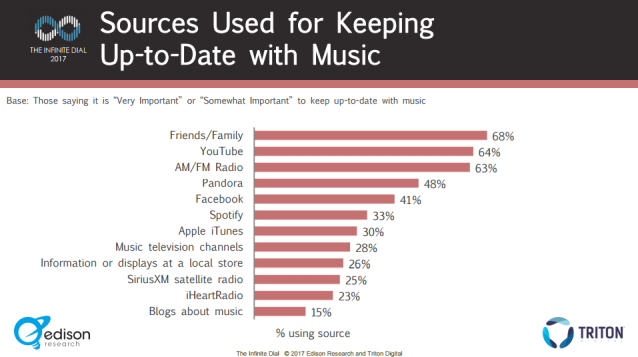 As in past editions of The Infinite Dial, the “Friends/Family” suggestion scored highest when respondents were asked what sources they use for music discovery — 68% rely on those personal connections. The next most-cited source? 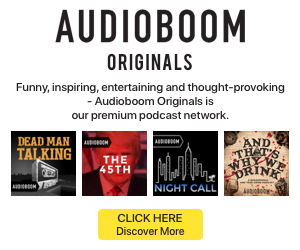 YouTube, which stretched past AM/FM for the first time, 64% to 63%. YouTube soars in importance, to 80% use for discovering music. That is more than Friends/Family through these filters (77%). 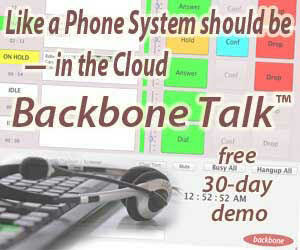 It is much more that AM/FM radio (50%). Spotify also zooms up to 59% from 335 in the unfiltered survey population. And here’s another interesting wrinkle. Keep both filters (at least “somewhat important,” and 12-24 group) and add “Used Mot Often for Keeping Up-to-Date with Music,” and compare with 2016. YouTube goes down, from 22% in 2016 to 19% in 2017. Spotify leaps up from 9% to 20%. That’s young listeners for whom music discovery is important, adopting Spotify as a discovery platform much more over last year. One more YouTube statistic. In the 12-24 group, YouTube has been used for consuming music by 91% of respondents. That’s a 91% reach. the monthly reach is 84%, and the weekly reach is 74%. The total population reach for YouTube as a music platform is 68%, or 57% as a monthly reach metric.